Monica Goodling is sitting before Conyers' committee right now. I hope to have a link to the transcript added to this post soon. She is young to be sure (seems younger than her age, which is also roughly mine), but is providing valuable information. 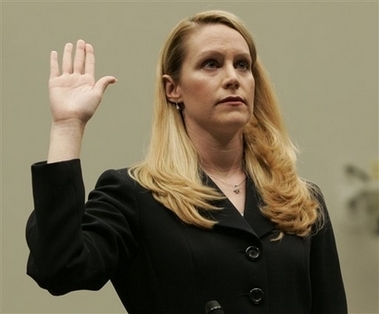 She has essentially testified that the US Attorney termination list was the responsibility of AG Alberto Gonzales and DAG Paul J. McNulty. The much more interesting questions being asked now involve the intimate links between the Bush White House and the DOJ. Senator Whitehouse of Rhode Island has uncovered that the Bush Administration has the most liaisons / direct contacts with the DOJ than any other administration since the DOJ's founding. "I know I crossed the line...[of] Civil Service Laws." Honesty is rare these days in the beltway. But the highlights of the day belong to Alabama Representative Artur Davis. It is he and California congressman Adam Schiff who introduced the House bill which authorizes a vote of No Confidence against AG Alberto Gonzales. Davis is Senate material and one damn good cross-examiner. He gets a cold beer for these two clips. He is the first lawmaker to get a witness to testify that Alberto Gonzales' testimony to Congress was not accurate (to put it lightly). Gonzales denied multiple times that he ever saw a draft of the USA termination list. But yesterday Goodling testified that he did. I think she was stunned by Davis' questioning. I suddenly love this guy. I never heard of him until this year, but he is in his third two-year term. He is currently the southernmost congressman to endorse Barak Obama for president. I wonder if Goodling didn't immediately realize that she was testifying that her former boss lied to Congress. When Davis said, "Let me help you a little bit with one other one," her reaction was an almost frightened whimper - "yeah." I wish this clip continued, because shortly after Davis got Goodling to confirm that Gonzales was present in the November 27th USA termination meeting (the meeting he repeatedly said he did not recall), Long Beach Republican congressman Dan Lungren threw a tantrum and tried to stop Davis' questioning. Goodling then asked to consult with her lawyer. After a brief recess, the committee voted 17-8 to allow Davis' questions to proceed. It was very entertaining stuff. Here is a clip of Davis asking Goodling about her final conversation with Gonzales in March 2007. She was uncomfortable speaking to Gonzales because she knew she would be a factual witness in the investigation of the USA firings. I don't think her final conversation with Gozales broke any law. However, I do think during that conversation, Goodling realized that Gonzales was hiding information from Congress, and that made her uncomfortable. She left her job ("took leave") four days after her conversation with Gonzales. The laugh of the day goes to Iowa Republican congressman Steve King. Here he slaps critics of the evangelical Regent University (Goodling's alma mater), telling them that Harvard and Yale were also founded on Religious/Christian principles. So don't throw stones, heathens! I wonder how few Americans know who the Calvinists were. I appreciate him mentioning them. If his words inspire people to dig deeper, they will see that Harvard was not founded as an evangelical or religious institution, nor were the Calvinists anything like Pat Roberts. Flashback time. Before I fled for vacation, Artur Davis grilled Alberto Gonzales for a good long time. Here's the full clip. Adam Schiff was quite good in his first round of questioning. He had a single line of questions that successfully tied the termination reasons to the AG's own performance. Simply put, if the AG says that one or more USAs were fired for delegating too much and losing the confidence of his or her staff, shouldn't the AG be held to the same standard? Well done, Mr. Schiff. Big thanks to NancyPelosi for uploading these C-SPAN videos.